It is perhaps surprising that one of the finest porcelain tableware manufacturers in France was founded 175 years ago… by an American. In 1842 David Haviland boarded a ship in New York bound for Europe and never looked back, settling in Limoges, a city already well known for its decorated porcelain. Haviland and Co would go on to produce beautiful porcelain for heads of state and royal families, not to mention discerning private yacht owners. Now run by Charles Edward and Theodore Haviland, the company has made a name for itself as the go-to brand for exquisite, handcrafted white porcelain pieces, featuring designs including traditional and more modern floral, animal and geometric patterns. The 24kt gold leaf, platinum or coloured filigree designs are intricately applied by hand or through a method known as chromolithography, the process of making coloured prints through lithography. 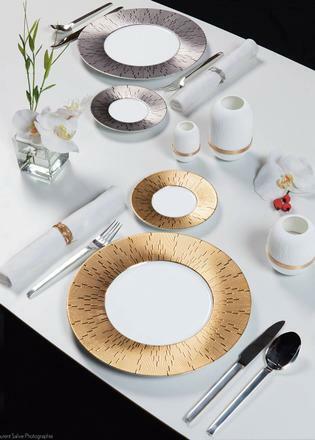 Popular collections include Hollywood, which utilises art deco motifs; Belle Epoque, which employs geometric stripes; and the very simple Clair de Lune, which has straightforward silver rims. Notable among Haviland’s many illustrious clients is the Ritz Paris hotel, for which the company designed the hotel’s entire tableware collection. It is perhaps unsurprising, considering its native country and the calibre of its offering, that it was chosen to work with the very best of French hospitality in this way. Haviland created three distinctive sets for the hotel – the Marthe, Ritz Imperial, Ritz Club by Jean Boggio and Damassé– which include plates, trays, bowls, tea sets and jugs. The Marthe has an elegant lapis blue and gold Louis XIV-style border, inspired by the original décor of the hotel; the Imperial has a pattern taken from the draperies of the Ritz Paris hotel’s most famous suite; the Ritz Club takes inspiration from France’s most famous monarch, the Sun King, with a dramatic pattern of the sun’s rays in gold leaf; while Damassé is inspired by the rich Damask fabrics often found in large Parisian residences. As well as being used throughout the hotel, the collection is also sold online via its website, so guests can take a little piece of the Ritz lifestyle home with them. The newest collection from Haviland looks skywards. The Souffle d’Or pieces are inspired by the astronomical phenomenon of the supernova, which takes place during the last stages of a star’s life. The rare event sees the star expanding and then exploding, giving the impression of creating hundreds of thousands more tiny stars in its wake, with the optical illusion that the original is glowing even brighter than before. It is easy to see how this celestial event could inspire the Haviland design team, which has created a set of pieces – including plates, bowls, vases, jugs and mugs – featuring painterly constellations using iridescent grey and matt gold. The modern design looks almost like a mosaic thanks to the tight clusters of stars, which are painted in such a way as to give the impression of an explosion fanning out from the centre to the outer edges. 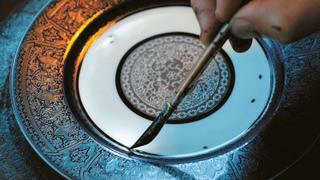 Haviland also offers a bespoke service for its customers, through which unique designs can be brought to life at the Haviland art studio, and made from the same quality 100 per cent Limoges porcelain.